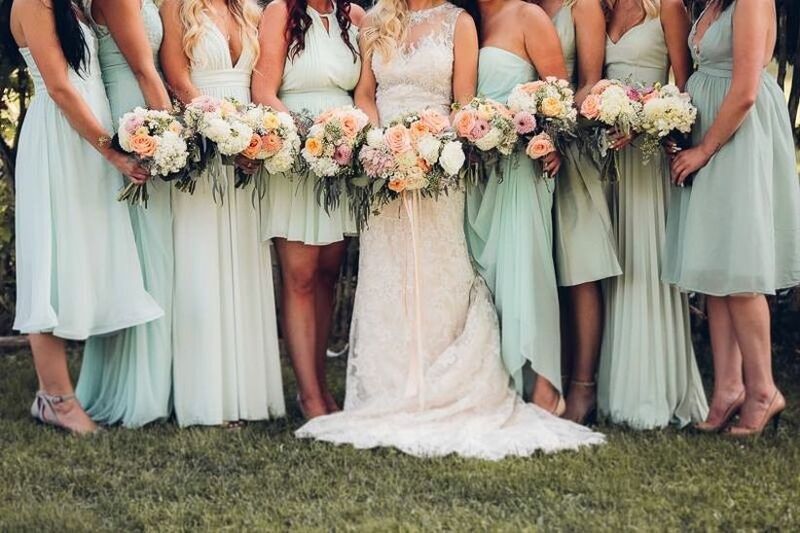 Everything You Need to Know About Wedding Ceremony Flowers | Wedding Ideas ARE YOU A VENDOR? Ceremony flowers include way more than just the bridal bouquet. Here are all the floral arrangements you may want to order to dress up your venue and your wedding party. After you’ve chosen your ceremony venue, you’ll want start searching for decorations. 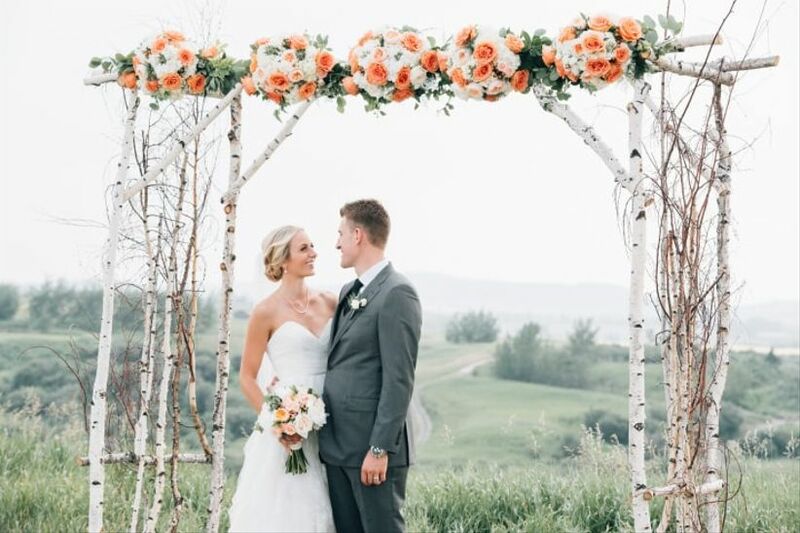 You can add everything from paper garlands to handmade signage, but flowers are the most popular way to spruce up a wedding venue. Aisle markers and altar arrangements aren’t all that you’ll need - remember the bouquets, boutonnieres and corsages for your wedding party as well. 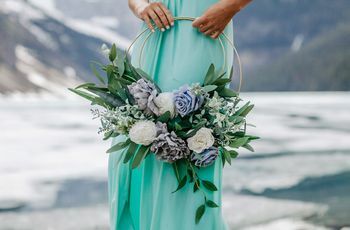 Tip: Flora and fauna typically eats up about 8% of your total wedding budget, but you’ll want to carve out a healthy sum for your reception flowers, as well. Here’s everything you need to know about wedding ceremony flowers. 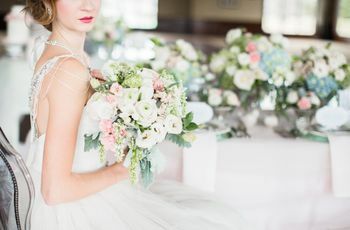 When you think of wedding flowers the first thing that comes to mind is probably the bridal bouquet. This handheld arrangement is the bride’s most treasured accessory - so it should suit the leading lady to a T. That means filling it with her favourite flowers in the colour of her choice. This will most likely be the first arrangement you plot out, so all the other flowers in your wedding should riff off of it. The bride isn’t the only one who gets to carry a bouquet, though. Each bridesmaid will get their own bouquet. These are typically a lot less extravagant than the bride’s, but include some of the same blooms. 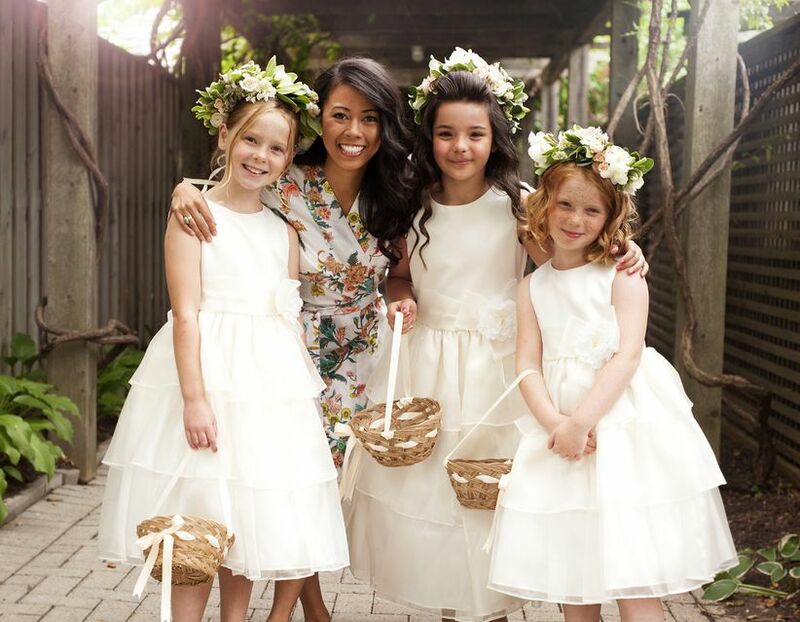 The flower girl and mothers may get one, too (providing that they are not throwing petals or wearing corsages). Traditionally, all men in the wedding party and a few VIPs in the crowd will wear a boutonniere. Namely, the groom, his groomsmen, the ring bearer and the fathers and grandparents of both partners. At some ceremonies the ushers and the officiant will also sport them. 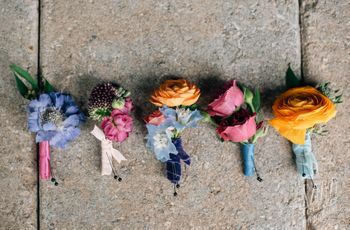 Boutonnieres can be customized to suit the groom by adding decorative flourishes, but should always tie in what the bride will be carrying down the aisle. 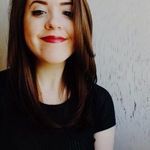 If you need a few tips on crafting yours, look here. Though the idea of corsages may bring memories of prom flooding back, they aren’t just for highschool students. You’ll probably want to purchase a few for your VIPs to wear during your wedding ceremony. Just who are these important figures? The mothers and grandmothers of both partners. As with all your flowers, make sure the blooms you choose for them compliment the bridal bouquet. As her title suggests, the flower girl needs flowers. This little lady’s job is to pepper the aisle with petals before the bride makes her way to the altar, so she’ll need a basket of those. If you don’t like the look of an aisle strewn with petals, the flower girl can carry a small bouquet instead. Before your guests take their rightful seats they’ll stop by a welcome table. This is where they’ll find programs, ceremony info and photos of you and your soon-to-be spouse. Make it match the rest of your ceremony by adding an arrangement or two. If you don’t feel like designing something special specifically for the welcome table, ask your florist to make something similar to your reception centerpieces. Your arrival should be nothing short of amazing, and jazzing up your entryway will help take it to the next level. Swath the door frame with garlands of flowers, add a pair of flower-filled vessels to each side or come up with something unique. Aisle markers are used to identify rows of seats (or pews, if you’re hosting a church wedding). If you want something a bit more interesting than just numbers or candles, add a few flowers to the mix. Make sure to use vessels that compliment your wedding theme. For example, if you’re hosting a rustic ceremony, maybe put them in small pots or wooden crates. The average aisle runner isn’t too fancy. 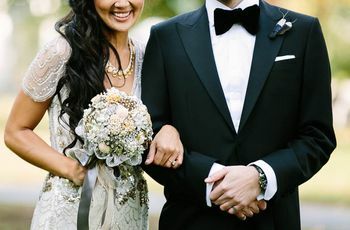 It’s typically a simple stretch of fabric that acts as a runway for the wedding party and happy couple as they make their way down to the altar. If you want to give it a little extra oomph add a few petals or line the sides with petite arrangements. Some couples like to get even more creative and add a design made of petals down the centre. Flowers can be used to signify loved ones who have passed away. If you want to reserve a seat at your wedding for them, add a flower or small bouquet at the place that they would have been seated. You may want to go with their favourite bloom or a flower in their favourite colour to make it even more sentimental. Remember to add a small sign along with it so nobody mistakes it for an empty seat. These arrangements help give your altar that little something extra. They range from minimalistic to jaw-droppingly dramatic and come in all shapes and sizes. Whether you want to place a pair of simple vessels filled with flowers on either side of your altar, go all out with a floral wall or skip them altogether is your call. 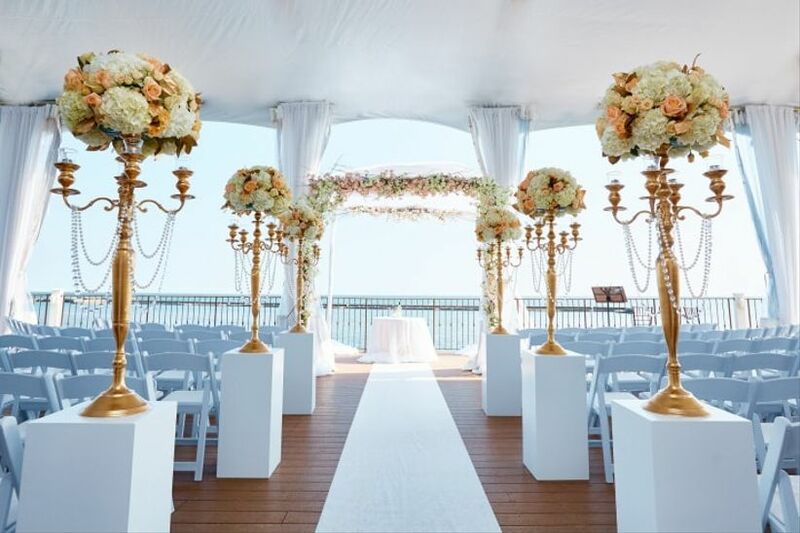 Whether you’re using an arch or arbor to spruce up an outdoor venue or saying your “I dos” under a chuppah for religious reasons, you don’t want the structure that you exchange rings under to be bland. Use flowers and greenery to give yours a bit of personality. You may want to opt for less expensive blooms to decorate them as they’re typically on the larger side (you’ll probably need more than a handful of roses to do the trick). 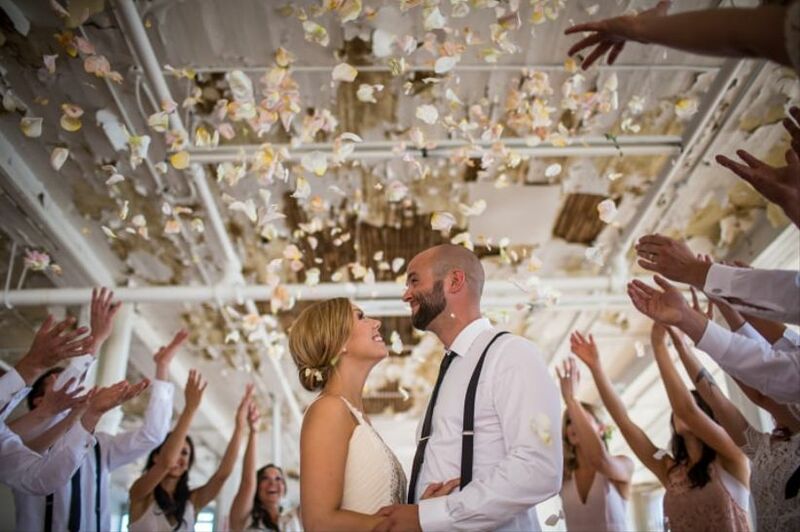 Want your guests to shower you and your beloved with flower petals during the recessional? Well you’ll need to have a healthy supply on hand. Before you place an order make sure your venue allows petal tossing. Some have restrictions on what can be tossed - if anything - so it’s better to be safe than sorry.